Graham’s “Allsorts” band lived up to their name last night with a super evening of eclectic jazz. As the name suggests and as Graham always says it is a band who play all sorts of styles for all sorts of musical tastes played by different musicians. Last night we were pleased to invite John Maddocks for a way overdue visit and worthwhile it was too. Their repertoire chosen by Tony Pipkin gave the opportunity for several features and John chose Wolverine Blues for his, Martin played Misty and Jim’s choice was For All You Know. In the tune Sentimental Journey Simon treated us to a great bass solo. This was a tune made famous by vocalist Doris Day. In between tunes Graham gave us snippets of information either about the tune or his or the band’s connection with the tunes – nice one Graham the audience liked the involvement. 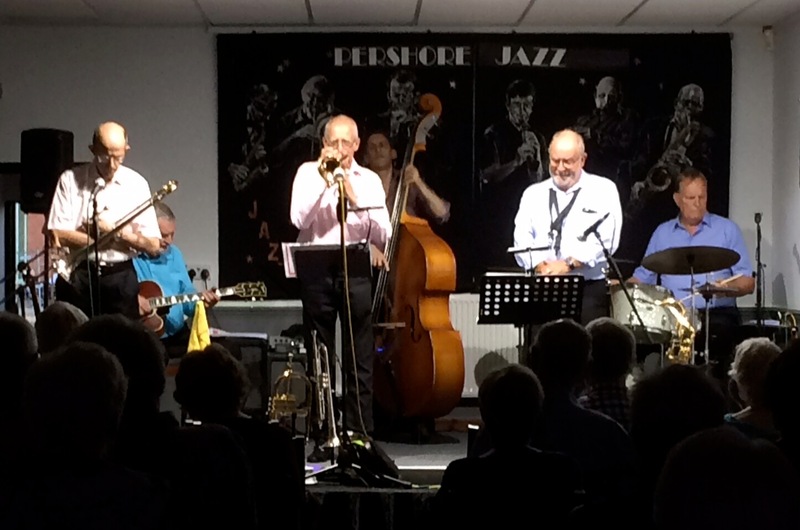 The second set started with a lovely jazz standard called Tipi Tipi Tin and like the first half the time disappeared all too quickly and they were finishing the evening with Swing That Music – a great number to end with and swing it did too. It was a hot evening outside and the jazz inside was hot and the comments from the audience when leaving were – how do they all just get together and play like that. All great musicians of course! Thanks for the music guys – much appreciated.